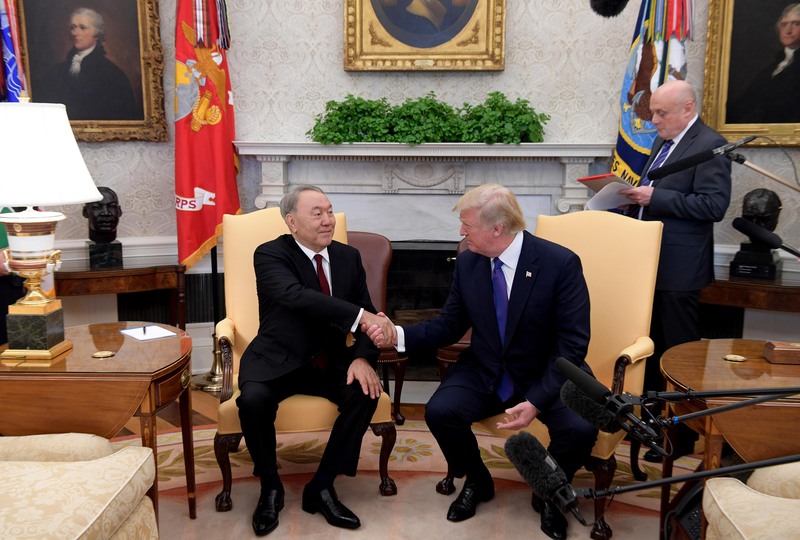 WASHINGTON – Kazakh President Nursultan Nazarbayev met Jan. 16 with U.S. President Donald J. Trump at the White House during Nazarbayev’s two-day official visit to the United States, the first such visit at the invitation of the country’s leader since 2006. After the pomp, ceremony and protocol at noon, the two leaders met in a closed-door session followed by an extended meeting with cabinet members from both countries present. They also held a joint press conference and a working luncheon. 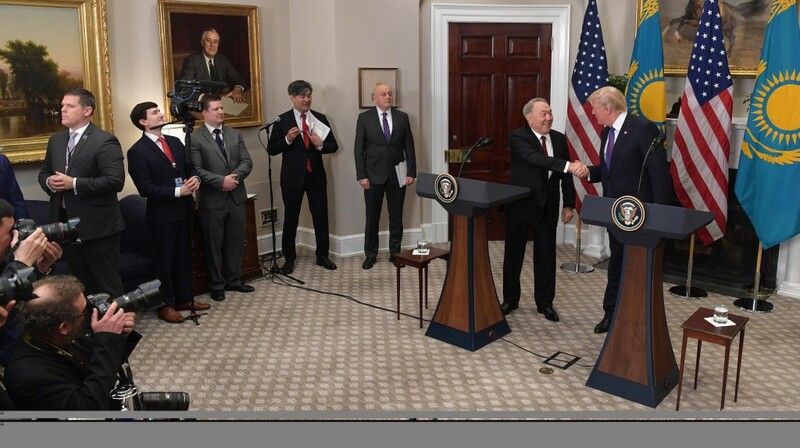 In a joint statement titled “Kazakhstan and the United States: An Enhanced Strategic Partnership for the 21st Century,” Nazarbayev and Trump reaffirmed Kazakhstan’s independence, territorial integrity and sovereignty, as well as the Central Asian nation’s role in advancing global peace and prosperity. The statement, which covered issues from Astana’s leadership role globally and regionally, to defence and security cooperation, including in Afghanistan and in the fight against terrorism and extremism, to economic partnership and the human dimension, attached a renewed importance to the role of the regional Central Asia plus the U.S. dialogue format, known as C5+1, in addressing shared challenges in the region. During the negotiations, Nazarbayev and Trump touched upon a wide range of bilateral and multilateral issues, including strengthening cooperation on political and security issues, trade and investments and people-to-people relationships through regular high-level meetings within the framework of an Enhanced Strategic Partnership Dialogue. High on the agenda was the issue of non-proliferation of weapons of mass destruction, including North Korea’s nuclear and missile programmes, which the two leaders condemned. On Afghanistan and regional security, the U.S. President thanked Nazarbayev for supporting the United States’ South Asia strategy by guaranteeing continuous logistical support and access to Afghanistan and contributing to humanitarian efforts. He also praised Kazakhstan’s support “for fair burden sharing” through past and future financial contributions to the Afghan security forces, as well as the offer to extend an Afghan specialist programme in cooperation with the U.S. to train Afghan civilian and security personnel at Kazakh universities. With regard to Syria, Nazarbayev briefed Trump on Kazakhstan’s efforts to bring about peace in Syria through hosting a series of negotiations in the nation’s capital, known as the Astana Process. The two leaders welcomed “diplomatic initiatives that achieve any genuine de-escalation of violence and strengthen the basis for a political settlement of conflict,” the joint statement read. To date, there have been seven rounds of Syrian peace talks in Astana in 2017. The visit coincided with Kazakhstan’s January presidency in the UN Security Council and, according to Trump, bilateral “cooperation has grown even stronger this month” during the Central Asian nation’s tenure in the UN body. Nazarbayev’s visit to the United States, the seventh in the history of bilateral relations, has sent an important political signal for expanding the countries’ bilateral business ties, deepening trade, economic, investment and innovation-technological partnership. The U.S. is one of Kazakhstan’s most important economic partners, with investments in Kazakhstan, according to the official report from Akorda, totalling around $50 billion and making the U.S. one of the largest investors into the Kazakh economy. 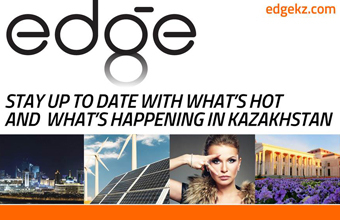 Currently, more than 500 American companies have operations in Kazakhstan. In the 10 months of 2017, two-way trade between Kazakhstan and the U.S. totalled $1.38 billion. Kazakhstan’s goods imports from the U.S., including aircraft, machinery, poultry meat and beef, electrical machinery, iron and steel products, prepared food, planting seeds, wine and beer, and snack foods, were $1.04 billion. Kazakhstan’s total exports of products to the U.S., which mostly consist of mineral fuels, ores, slag, uranium, thorium, iron and steel, inorganic chemicals and other base metals, totalled $339 million. The Nazarbayev-Trump meeting was followed by a business forum with American executives at the U.S. Chamber of Commerce, which resulted in the conclusion of around 20 agreements worth $7.5 billion. Nazarbayev noted Kazakhstan and the U.S had reciprocally introduced 10-year business and tourism visas back in December 2016, a decision that marked the 25th anniversary of diplomatic relations between the two countries. He also said work is underway to open direct flights between Kazakhstan and the United States. The two presidents pledged to promote a fair and reciprocal economic partnership that increases bilateral trade and investment and creates jobs and opportunities in both countries. 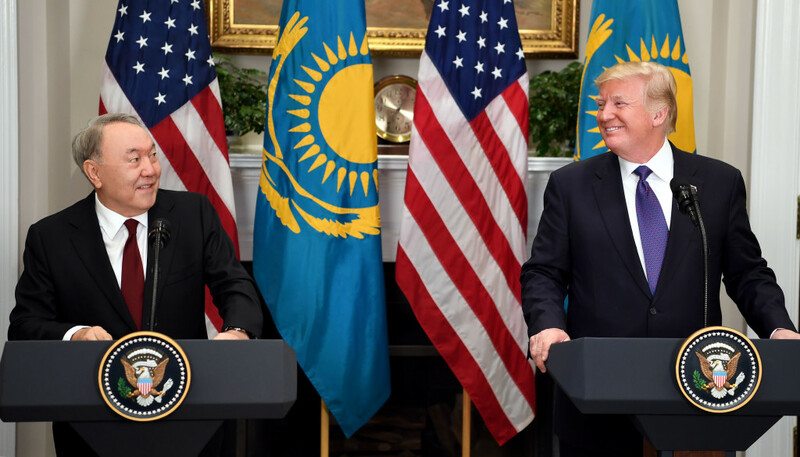 Trump applauded Kazakhstan’s ambitious plans to develop a diverse and innovative economy with investment-friendly climate, noting that U.S. development finance institutions seek to support investments in Kazakhstan. “He’s on his way – very rapidly,” said Trump of Nazarbayev in reference to the strategy announced by the Kazakh leader back in 2012 to become a top 30 global economy by 2050. The leaders pledged to explore bilateral cooperation in the digital economy, healthcare, infrastructure, civil aviation, finance and banking, agriculture, and energy sectors. They reinforced their commitment to the Central Asia Trade Forum and the Central Asia Trade and Investment Framework Agreement (TIFA). Kazakhstan and the United States also plan to strengthen cooperation in the use of space technologies to assess environmental hazards and mitigate the threat of natural disasters in Kazakhstan. Another major topic of discussions for Nazarbayev was the sanctions issue, which the leaders agreed to consult on to avoid any unintended consequences for Kazakhstan’s economy. The programme of Nazarbayev’s visit also included a working breakfast with U.S. Vice President Mike Pence, meetings with U.S. Energy Secretary Rick Perry, President and Chief Executive Officer of the Overseas Private Investment Corporation (OPIC) Ray Washburne and others on political and energy issues. On Jan. 17, Nazarbayev was to visit the Library of Congress, which came as a testament to the strong cultural ties, evidenced by bilateral partnerships, agreements and exchanges. Nazarbayev’s visit to the U.S. will continue in New York Jan. 18 where he will chair the UNSC Members’ High-Level Thematic Debate on “Non-proliferation of weapons of mass destruction: confidence-building measures” at the UN headquarters.